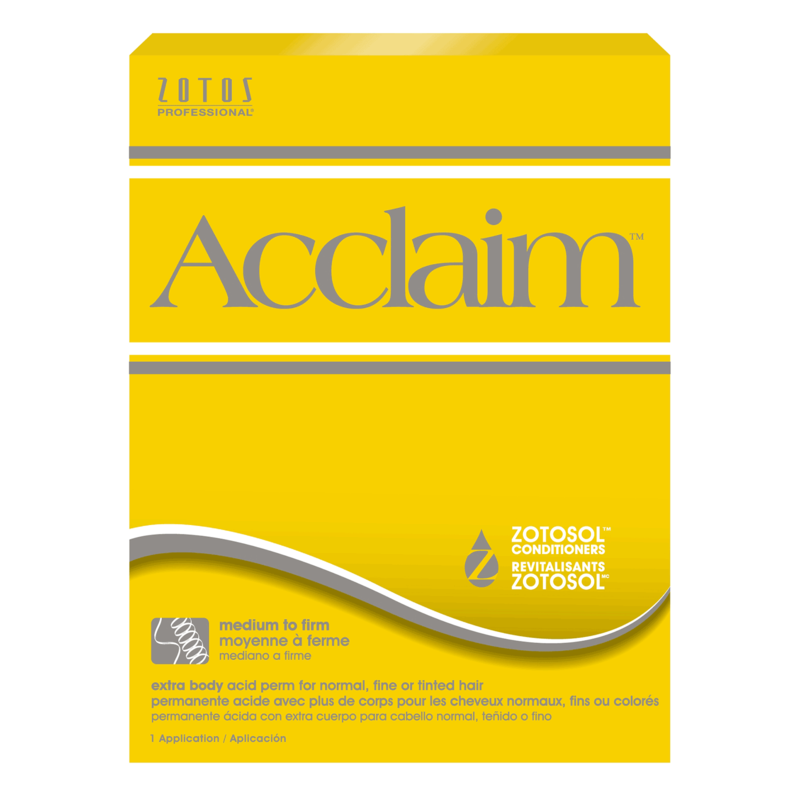 Acclaim Acid perms allow you to create the texture, volume and styles your clients desire. The Acclaim formula, combined with natural processing, provides optimum true-to-rod size curls with consistent, predictable results. Best/Recommended for: MEDIUM to FIRM curl on normal, fine, or tinted hair. Exclusive Zotosol™ conditioners replenish and strengthen the hair for healthy looking shine, smooth feel and greater styling control. Water, Ammonium Thioglycolate, Laureth-23, Ammonium Chloride, Ammonium Hydroxide, Styrene/Acrylates Copolymer, Potassium Cocoyl Hydrolyzed Collagen, Benzyl Salicylate, Cinnamyl Alcohol, Citronellol, Geranlol, Fragrance/Parfum. Water, Hydrogen Peroxide, Silk Amino Acids, Olealkonium Chloride, Ceteth-20, Quaternium-75, Disodiu, Phosphate, Mineral Oil, Cetearyl Alcohol, Dimethicone, C11-15 Pareth-9, Tallowtrimonium Chloride, Phosphoric Acid, Sodium Lauryl Sulfate, Methylparaben. "This perm is easy to use...doesn't burn hair. Pleased with the results each time."